I just recently finished the book Solve For Happy. 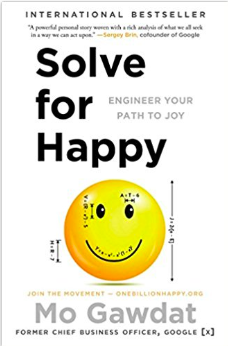 It’s an “engineer’s take” on the subject of being happy…and I really found it fascinating. The author, Mo Gawdat, is the Chief Business Officer at Google X and the book was thoughtful, emotional (Mo lost his son), long, spiritual and more. You can find the book here. I listened to the audiobook, and it was a longer one. Mo dives deeply into topics, so I found it worth the time. But for those who want a quick snapshot, here are a few takeaways I found from the book. You Are Not Your Thoughts: I found this interesting because I have been talking and writing about this a lot. “We all have that voice” that prattles on in our head. It tells us we are not good enough. It yells about danger and how everything will not work out. It’s often mean and mostly negative. Mo tells us that this voice is not you…and how to take a step back and listen to it less…so you can be more happy. One of my favorite concepts in the book involves Mo talking to his brain, “No. That is not a good thought. Go and bring me a better thought.” Love that. Negative Emotions Are Not in the Present: Gawdat spent a great deal of time outlining all kinds of emotions and how they can affect our happiness. Then he pointed out the negative emotions. What do they have in common? Nearly all of them are rooted in the future or the past! This was a bit of an “aha” for me. If you are angry about being passed over for a promotion, that is rooted in the past. Worried about an upcoming meeting? That’s in the future. And since the past is done, and the future is just our imagination, the things that are making us unhappy are just our own thoughts. Powerful. Live in the Present: We need to get back to “living in the present.” That is when we are most happy, content and (dare I say) joyful. Mo says that when he finds himself getting swept away with negative emotions he does a simple exercise. He closes his eyes. Then he opens them and closes them again. Then he describes what is in front of him…in detail. It brings him back to the here and now. This was a detailed book and he covers a LOT more than this. But those are just a few concepts that jumped out to me. He even talks about how to overcome our fear of death and gives his take on what comes “after.” As I said, it’s a lot…but I enjoyed it. You can find the book on Amazon here. Want to make us happy? Sign up for our VIP newsletter here. We are working to provide you value each and every day.